Click here to contribute to Terry's case. Or shall we say, "Whoops! We accidentally deleted the Constitution"
This weekend Terry attended the Values Voter Summit. The summit is sponsored by the Family Research Council. FRC is perhaps the preeminent conservative lobbying group and their programs and events have been hugely effective. The event drew a substantial representation of conservative candidates, spokespersons, and organizations. You can see the entire list at the Values Voter Summit website. When we spoke to Terry on Saturday afternoon he sounded extremely discouraged. How could this be when he is largely among friends? Here's why. This is very important. When we asked why he sounded so discouraged he answered, "I've seen display after display for every conservative issue. There are First Amendment groups, Second Amendment groups, Freedom of Religion groups, groups representing objectivity of the press, school voucher groups, marriage amendment groups, pro-life groups, fair tax groups, and almost every other conservative issue. But none of this matters if we allow the authority of the Constitution to be diminished in any way." You see, this was and is Terry's only issue. Why can't the so called president be held to the clear constitutional standards concerning eligibility? Why has no one in any position of authority at least officially looked into this? Did she not hear a thing? Did she not read one brief? Does she not know that Terry was ready to go and wanted to go? Was she so oblivious to the issue that she totally missed the point of Terry's action? Is she competely oblivious to the mounting body of evidence concerning Obama? Have we accidentally deleted the Constitution? Please, take this seriously. We invite you to read the three articles in the navigation area. They are each full of issues, links, and facts concerning the eligibility issue. The Constitution was not created by accident. It wasn't a frivolous effort. Some seem to think a bunch of guys were sitting around a pub one night and said, "Hey. Let's start a country." But it is anything but that. Our Constitution, Bill of Rights, Declaration of Independence, and other founding documents came out of millenia and struggle, death and dialogue, debate and discussion, bravery and boldness. It was the most precise expression of a form of government that finally moved away from the concept of a sovereign monarchy to government by the people, for the people, and of the people. The Constitution is demanding. It demands that we learn it and why it must be protected. The Constitution is hard to change. Just as hard as it was to create. If you have not seen "Amazing Grace" or the documentary, "The Better Hour," consider it your assigment for the week. You can buy them from Amazon. Click here to buy "Amazing Grace" from Amazon. Click here to buy "The Better Hour" from Amazon. Click here to visit the Better Hour website. There is a poignant scene in the movie Amazing Grace.·William Wilberforce has just rolled out a petition to end slavery signed by more than 300,000 people. 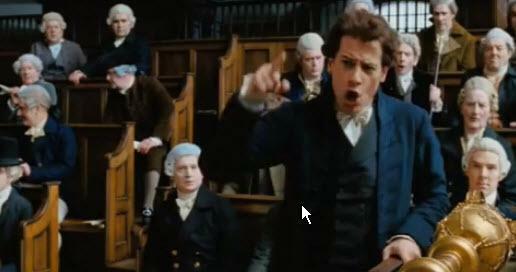 Then Wilberforce and another parliamentarian engage in an argument and Wilberforce says, "It's the will of the people." The other parliamentarian says, "The people? The people? It's against the natural order." You see, even in 18th century England the parliamentarians saw themselves as divinely appointed. Somehow different than the populace. But our Constitution declares the value of the individual as being endowed with·unalienable rights (rights that cannot be revoked under any circumstances). It is on this basis that we formed representative government (not a democracy). We elect individuals to manage our affairs locally, statewide, and nationally, assuming they will manage according to Constitutional law which enabled them to be elected in the first place. Any elected official or appointee who flagrantly refuses to comply with the Constitution by commission or omission must be called into account. That is all Terry asked for. Simple compliance with the Constitution. 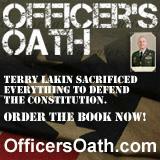 To date, neither Obama, nor his staff, nor any of the sitting members of Congress have been willing to do what Terry did. What don't our leaders understand about this? If they are so willing to not enforce this clear and important Constitutional requirement, what will they ignore next? Freedom of speech? Freedom to bear arms? Freedom of religion? Freedom of the press? The right for redress and grievance? You may say, "It can never happen." But it is happening and the consequences are staggering. 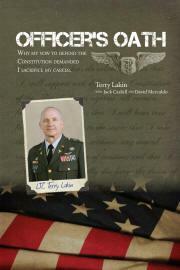 Then consider beginning or continuing to support Terry through the Terry Lakin Action Fund Trust. Why? No, Terry did not lose a limb, he's not still in prison, his wife and family didn't leave him, he still has his house (for a while), and if he a had dog it would still love him. However, please note what he did give up: His career, his pension, his benefits, 6 months of his life, and perhaps his future, all in an effort to defend the Constitution. A. We must not forget what he did. His action brought the eligibility issue to the forefront and kept it there. Call it gift of appreciation if you want. B. The Trust has work to do on Terry's behalf. This includes pre-production on his book and various issues surrounding his discharge and return to normal life. C. Terry and Pili have spent basically all their savings and more. He can never earn back what he's lost. Please get the rest of the story by clicking here to read our article, The Audacity of Obama.